This year we started planning and designing our Christmas trees only 3 weeks after Christmas. It may seem absurd but it really is the best time as the previous year’s trees create lots of new ideas. We work as a team of four people travelling across Europe trying to find decorations that fit our new ideas and concepts. 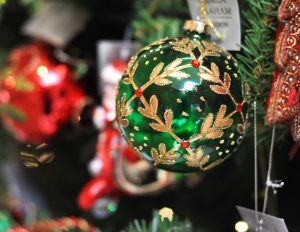 This year, we have given the traditional red, green and gold tree a strong element of bling and glitz with over 800 decorations combining to create a sea of colour. Our second tree is very cool. A cream and soft gold combine with a hint of turquoise to calm the senses. This tree has over 2,000 baubles and lights and is designed to provide contrast to our other strong tree themes. An Indian Christmas beckons you at the foot of the stairs incorporating the Diwali tradition of rich vibrant colours typical of the subcontinent featuring birds, elephants, antelope and thousands of colourful baubles and flowers. You really will need your sunglasses to view this tree! Up stairs we travel to Africa for our fourth large tree. Here the emphasis is on the hand made. 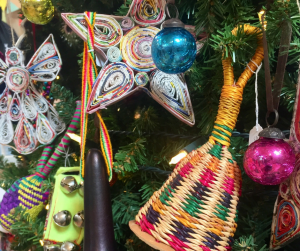 It features paper angels, trees and hearts, along with beautiful rattling musical instruments from Ghana. 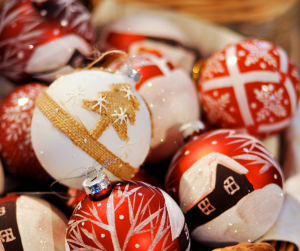 All set off by small, brightly coloured baubles and decorations. Back downstairs, as you enter the main door, a Scandinavian Christmas awaits you with beautiful stars, snowflakes, painted hearts, stars, reindeer and exquisite paper baubles all hanging above a frosted tree. 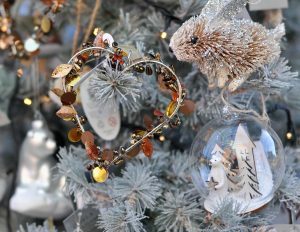 Our blue glazed link has been transformed into a woodland glade with over 20 trees and 5,000 baubles, birds and animals. In the middle, you’ll find a frosted rose tree with rose fairies, birds and fruits. It really is magical when the night starts to creep in and the lights in the trees reflect back on the inhabitants of this wooded glade. Food features heavily too, which it always does and should do at Christmas. 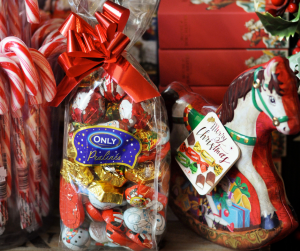 We have travelled far and wide to find many new food producers and source some very tasty (and well tested) gourmet chocolates, chutneys, jams, panettone, pickles and other sweet treats all of which will remind you of Christmas with familiar flavours, elevated to new and delicious heights. Look out for our kitchen bringing you a strong flavour of Christmas with our savoury quiches and poacher’s rolls. Watch out for the Christmas cake and Christmas Eccles – a gingerbread cake is also on the way. 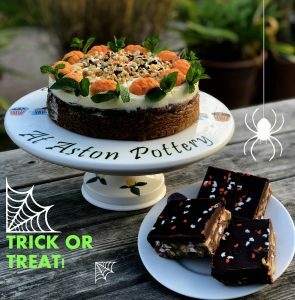 But before that for Halloween we have made a special carrot cake with mascarpone cheese topping, which is being displayed on a new pumpkin cake stand designed in the pottery. We hope you like it. If you can get time do bring children, grandchildren, or even great great grandchildren along! We are sure that we can give them an experience which they will always remember and hopefully you will too. Without a doubt the team of people working at Aston Pottery have excelled themselves this year, be it food in the cafe, displays in the shop, or the beautiful new rose design from the pottery. We would really like to emphasise that the shop is a total team effort, with over 40 people working to bring you our Christmas experience. We are very proud of our staff. Come and see what you think!